Poor old eggs; just as they recover from one slur, along comes another. Eggs, as we know, can harbour a bacterium called salmonella. 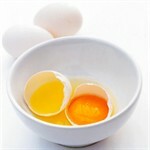 Cases of food poisoning, or even death, from eating eggs are isolated but do occur. Therefore, the only way we can be absolutely certain of not being affected is by only eating eggs that are well cooked, with hard yolks and no trace of softness or runny yolk at all. Ugh! What we all need to do is consider this very seriously and be individually responsible for making our own decisions. Life, in the end, is full of risks. The only way I can be absolutely sure I won't be involved in a car accident (and statistically this is a far greater risk than eating eggs) is to never ride in a car. But I am personally willing to take that risk – as I am when I eat a soft-boiled egg. So it's a personal decision. As a general practice, though, it is not advisable to serve these to vulnerable groups, such as very young children, pregnant women, the elderly or anyone weakened by serious illness.